Complete and balanced dog food for adult and senior dogs of all breeds. Ideal as a general maintenance food to help maintain healthy skin, coat and digestion. Ingredients Brown Rice (67%), Chicken Meal (20%), Oats, Peas, Chicken Oil, Sunflower Oil, Seaweed, Vitamins & Minerals. 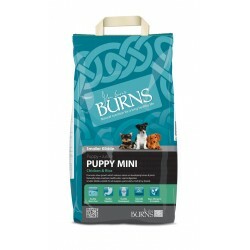 Burns Original Chicken and Brown Rice is a complete, balanced, highly palatable premium dog food for adult and senior dogs of all breeds. It is ideal as a general maintenance food and contains all of the essential nutrients your dog will need for lifelong health and vitality. This dog food is also suitable for the management of many dietary related health problems. 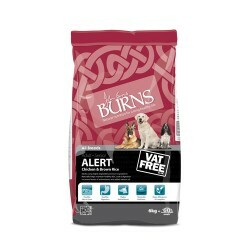 Burns Original Chicken & Brown Rice contains all of the nutrients your dog needs and avoids those which cause the build-up of toxic waste in the system. 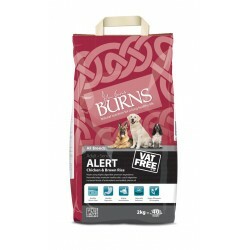 Burns Original Chicken & Brown Rice is hypo-allergenic, so it is suitable for those sensitive dogs. It is formulated without ingredients such as wheat, soya, dairy, artificial colourings and artificial preservatives which are known to cause food intolerances. Burns Original Chicken and Brown Rice contains only the finest quality ingredients Burns Original is highly digestible therefore feeding amounts are lower, meaning that daily feeding costs are significantly lower than those of other premium brands. And there's less poo to clean up!